BackupChain is a powerful VMware backup software that has been optimized to back up large files, such as VMDK virtual machines running on VMware Workstation or VMware Server, on top of Windows or Windows Server platforms. Live replication of virtual machines to other PCs / servers on the network, or local drives, or FTP sites. No interruptions or snapshots necessary. Using BackupChain Server Enterprise Edition you can restore individual files and folders from your storage folder without the need to restore the entire virtual machine. This feature is a valuable time saver and works for deduplicated backups, too, such as incremental and differential VMDK backups. See What is Granular Restore? This innovative backup feature is only available in BackupChain: Often you want a full virtual disk backup nightly but you would like to back up specific files inside the VM more often. For example, say you have a Windows VM running SQL Server. You want to back up the virtual machine every night but you would really want backups of SQL every hour. Rather than backing up the entire VM every hour you could create two separate tasks: one to run at night backing up the full VM using incremental deduplication, and one task running hourly backing up just the SQL data folders residing inside the VM. Using BackupChain Server Enterprise Edition you don’t need to install anything inside the VM, it is all handled on the host. Backing up and restoring VMware is a simple process. To set up your backup, you simply select the folder containing the VMX and VMDK files. state only took 14.1 KB and 8.87 MB to complete! order to perform a backup copy, BackupChain connects to the VSS service; the operating system then flushes out its cache and prepares for live backup. Since virtual machine files (VMDK file format) tend to be many GB large, they need to be processed more efficiently than regular files, which are considerably smaller. For best performance, the backup target should be another RAID or SCSI drive, an eSATA external drive, an USB drive, or another server on a Gigabit network. BackupChain supports all these constellations and in addition, BackupChain permits FTP and FTPS targets to enable data centers to back up their virtual machines to other geographic locations. compression technology, which ensures that backups use only minimal amounts of storage space. This compression type reduces the load on the host server but it also reduces bandwidth because only the actual byte-level changes within the virtual machine are stored. This is why BackupChain is perfectly suited for cloud and remote virtual machine backups, even via FTP. BackupChain’s backup technology does not require a locally stored history of VMs from previous backup cycles, so your VMware servers can run on minimal hardware. And since most VMs change only minimally each day, you can easily move incremental and differential backups over the Internet straight from your VMware host. within reasonable use of CPU resources. In order to keep the processing time to a minimum, optimal resource usage is necessary. compliant) and utilizes all CPUs and CPU cores simultaneously. This technology also ensures the highest possible data rate is drawn from RAID controllers and other high-speed drives. BackupChain for VMware was implemented with a flexible scheduler that permits complex schedule settings and concurrent execution. This feature allows administrators to utilize their resources to fullest extent possible and schedule tasks at complex intervals as needed. 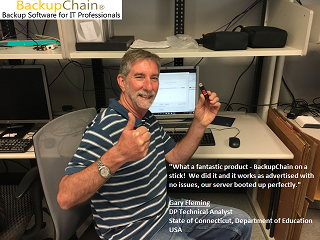 BackupChain is the only all-in-one solution on the market with a built-in FTPS server and client, which are the building blocks needed to quickly set up a private remote backup system. VMware VMs can hence easily be backed up and restored off-site over the Internet to a remote location without the need for additional software. Administrators concerned about security can switch on the military-strength encryption feature and transmit over FTPS as an option. cover your VMware as well as Hyper-V backup needs in your organization.